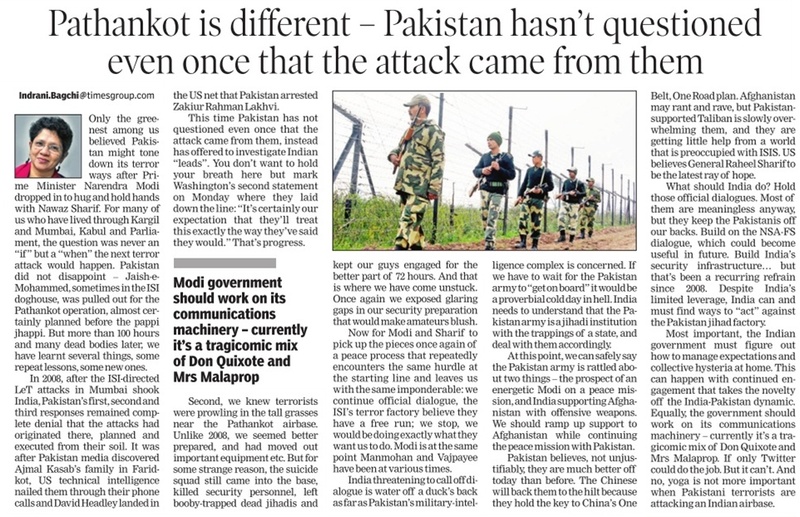 Even as India indicated that it did not favour “derailing the ongoing peace process” in the light of the Pathankot terror attack, both Prime Minister Narendra Modi and National Security Adviser (NSA) Ajit Doval have made it clear to their Pakistani counterparts that any further engagement would “entirely depend on what they deliver” on the vital inputs relating to the terrorists and their handlers based in Bahawalpur and Sialkot. Sources said Modi, in very “uncertain” terms, told Pakistan Prime Minister Nawaz Sharif that it would not suffice to say that the terrorists are “non-state actors”; rather, India expects from him “credible action” to bring the culprits to the book. “All evidences, including phone intercepts, phone numbers of handlers in Pakistan, their names and locations have been shared. Now they have to take action. We expect them to take action in line with what they did in the case pertaining to the Peshawar terror attack of December 16, 2014,” sources said. On that fateful day, seven gunmen affiliated with the Tehrik-i-Taliban (TTP) launched an attack on Army Public School in the city, killing 132 schoolchildren, besides others. Sources said, in his conversation with his Pakistani counterpart Gen Naseer Khan Janjua, NSA Ajit Doval communicated about three specific handlers – Qashif Jaan of Sialkot and Maulana Ashfaq Ahmad and Hazi Abdul Shaqur of Al Rahman Trust in Bahawalpur. Even the phone details of the conversation between one of the terrorists, who attacked the Pathankot air base, and his mother have been given to Janjua, they added. Around 1,000 Army men and Punjab Police personnel have converted Pandher village, around 2 km from the Tibri cantonment, into a fortress following reports that two armed men in Army uniform were seen moving around in a suspicious manner in the area. Two SWAT teams of the Punjab Police have reached the area. “The threat is real. It is not a hoax call. We have sounded an alert throughout the state,” said an SSP-level officer. Even as NIA Director General Sharad Kumar held a series of meetings at the Air Force complex in connection with the January 2 Pathankot terror attack, villagers said they saw some people in Army uniform entering sugarcane fields having 15-foot-high crop. “The Army has got vacated 500 houses in Pandher and adjoining Bhulechak and Babbehali villages,” sources said. 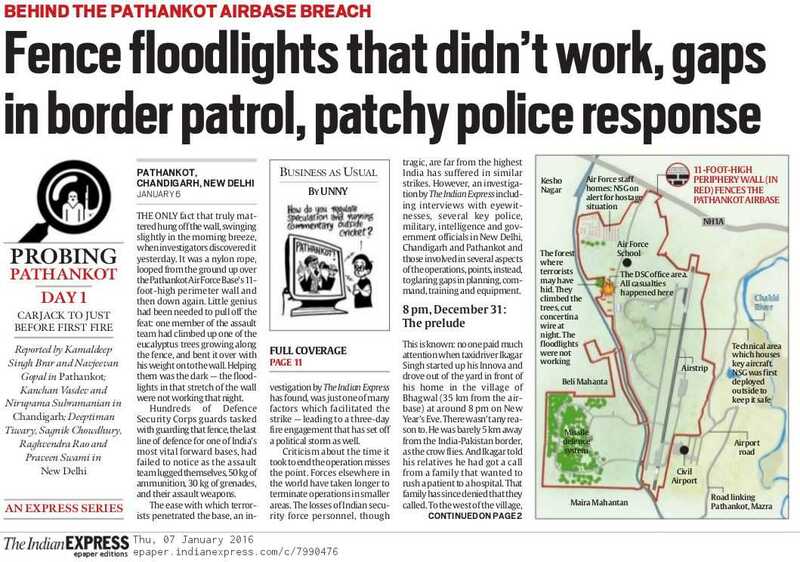 The terrorists who attacked the Pathankot air base and the Dinanagar police station were also in Army uniform. “The fact that the cantonment area is just 2 km away has added to our worries. We cannot take chances. More forces are being requisitioned,” SSP Toor said. DGP Suresh Arora, who returned to Chandigarh from Pathankot today, was being regularly updated about the developments. A massive search operation was on and neither the Army nor the police were willing to comment. 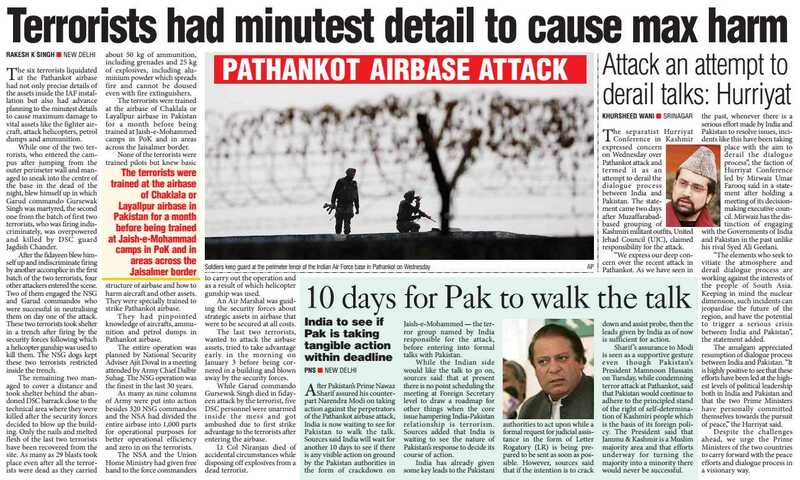 Besides protection of strategic assets and families of soldiers residing at the Pathankot Air Force station, the safety of 23 trainee fighter pilots from other countries was a major concern for the Indian security establishment when terrorists attacked the air base on the intervening night of January 1 and 2. Trainee fighter pilots belonging to Afghanistan, Nigeria, Sri Lanka and Myanmar were present at the Pathankot air base on that day. 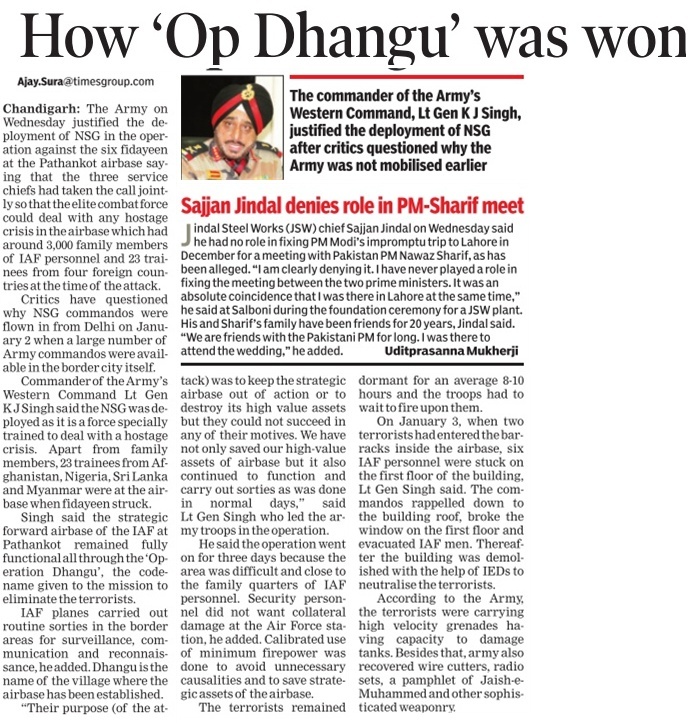 This was revealed by Lt Gen KJ Singh, Army Commander, Western Command, today. The safety of those pilots was a top priority for the security establishments involved in neutralising the terrorists, he said. Listing the “successes” achieved during the operation, he said, “There has been no collateral damage... Around 3,000 families (11,000 people) live in that air force station. No harm was caused to them. More importantly, there were 23 foreign trainee pilots from four friendly nations. All of them are safe.” There would have been a crisis situation had the terrorists taken hostage even one of them, he said. He also defended the decision to deploy the National Security Guard (NSG) to deal with the situation. 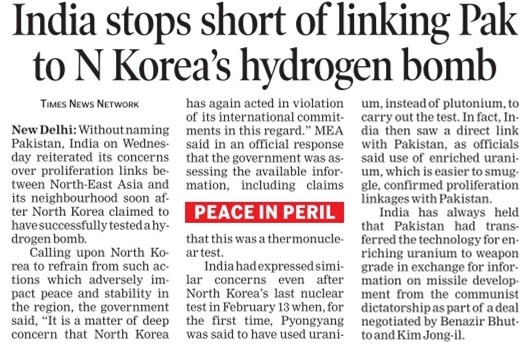 “The decision to call in the NSG was taken by the appropriate authority, including the Services chiefs. There could have been a hostage crisis. Besides 3,000 families of Air Force personnel, some foreign trainees were also present there. What if even a single foreign trainee was taken hostage? 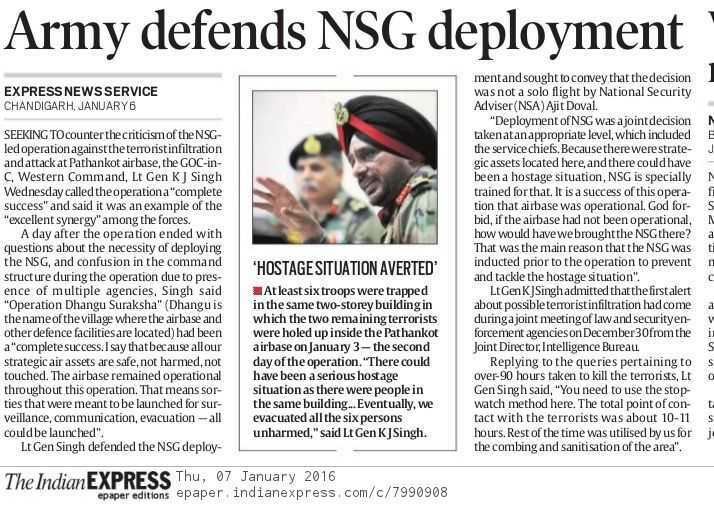 The NSG is specially trained to deal with such situations,” he said. “Had the air base suffered any damage in the terror attack, it would have been very difficult to fly in the NSG there. That was the main reason that the force was inducted at a very early stage of the operation,” he said. He said the operation was a “complete success”. On disposing of terrorists’ bodies, he said of six, two bodies are completely charred. The other four could be booby traps. A hand grenade hanging with the body of a terrorist is visible. “We have yet to decide whether to destroy these or not,” said Lt Gen KJ Singh, army commander, western command. The apprehended individual was nabbed near the gates of Air Force base by the security personnel. He was carrying a bag which did not had explosives or ammunition. Pathankot, Jan 6: One suspected terrorist has been arrested by the security forces at the Pathankot air base by the Indian army. The apprehended individual was nabbed near the gates of Air Force base by the security personnel. 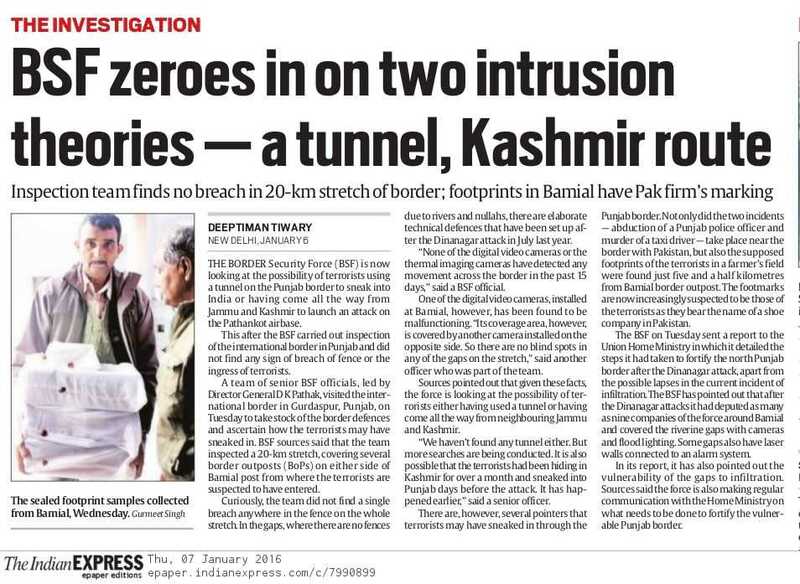 As of now, no confirmation is received whether the intercepted person belonged to the Jaish militants. The apprehended person was carrying a bag which did not had explosives or ammunition. The combing operations are yet underway. The IAF base, located near the Jammu-Pathankot Highway, is stretch for over several kilometers with a significant patch of forest area lying in between. Nearly a hour before the suspected terrorist was apprehended at the gates of IAF base, the Punjab Police and state Intelligence department issued an high-alert in Gurdaspur after two men were seen in passing near the Timbri camp in army fatigues. JAISALMER: Defence establishments in Rajasthan have been advised not to share their contact details with any caller without proper verification. District police has alerted the defence officials to take measures and ask officials to be cautious in the wake of the recent attempts made by Pakistan intelligence agencies to extract contact details of the defence establishments through internet calls. Pak intelligence agency ISI, through internet calls, had tried to get landline telephone numbers of officers and jawans of the Indian Army from employees of the BSNL office here. Such calls were received from Pakistan at the BSNL office here during the war exercise at Phalsoond area of Pokhran between September to December 2015. According to district telecom officer Yogesh Bhaskar, during the war exercise at Pokhran sub division, the Army unit here was allotted new numbers. It was then that the BSNL's accounts division got calls from Pakistan seeking information of telephone bills of unit officers and jawans. The caller also sought numbers of various Army locations. The calls though are made from Pakistan but are identified as those made from New Delhi. "The callers tried to hide their location through internet calling but we managed to identify their exact location and sounded alert," said the BSLN official. He said at that time they could not know that calls were being made from Pakistan and the call attendant gave one or two numbers to Pakistan. 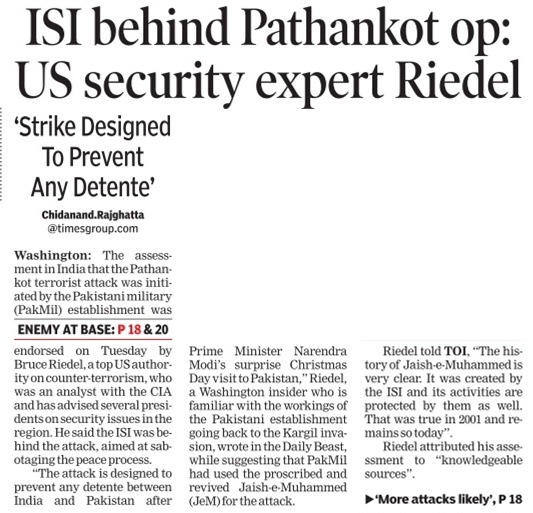 "Later intelligence agency alerted us that phone call was from Pakistan," he said. Defence spokesperson Lt Col Manish Ojha said Pakistan calls to Army at the border areas is a serious problem. Army forces and their family members get calls and looking at this Army men and their family members have been told not to fall in trap to these calls and not to share any information about the army. "We have advised defence officials to be careful and also impose restrictions on their own personnel," said superintendent of police Jaisalmer, Rajiv Pachar. He said that he has written letters to Army, IAF and BSF HQ in which it has been advised to keep watch on officers and jawans carrying phones and cameras in sensitive areas. Meanwhile, proper documentation of labourers working at the construction sites on defence premises is being done in view of the Pathankot terror attack. District police chief Pachar said important defence institutions have been asked to ban mobiles with cameras on their premises. They have been asked to keep a watch on telephone number of officers and jawans. The district special branch of the police has been directed to be alert and officers have been deployed at under construction cantonment and at the Chandan field firing range where on March 18 IAF's Iron fist exercise will be held.